The TT REST API gives you the tools you need to leverage the power of the TT platform within your own applications. You can access the same product information services, risk management and market connectivity used by the TT platform - all through an easy-to-use REST API. TTID: Authenticate and authorize applications to access the resources of the TT platform. PDS: Request information pertaining to exchanges, products and instruments. Ledger: View transaction details and historical record. Monitor: View positions and SOD records for a given account. Risk: Manage risk, limits and permissions. To view a sample application which makes use of the TT REST API, visit TT's public Github repository. All requests to the TT REST API require the inclusion of an application key in their header. In addition, most services also require a token which is retrieved using the application key secret. The application key and the application key secret used to generate the token must be created in Setup. 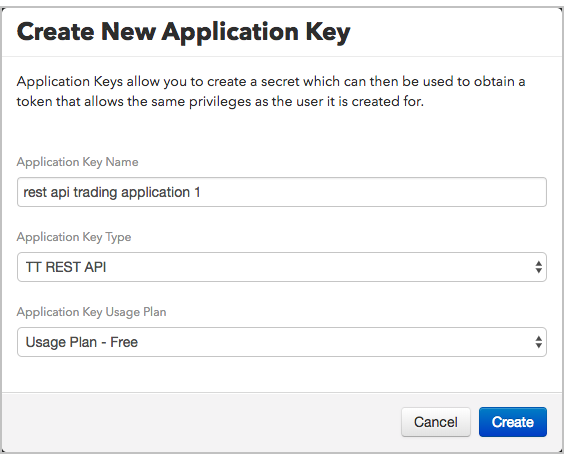 Note: Creating TT REST API application keys requires company administrators to enable the Can create TT Rest API key setting for the user. Log into the UAT environment (ext_uat_cert) to create app keys for development. Log into the Live environment (ext_prod_live) to create app keys for accessing live data. Click Users in the left navigation panel and select your username in the data grid. Click the App Keys tab. In the title bar of the App Keys data grid, click New. Enter a user-defined name in the Application Key Name field. In the Application Key Type drop-down, select TT REST API. Select the desired usage plan in the Application Key Usage Plan drop-down. Note: In the UAT testing environment, only the free plan is available. In the Live environment, only the Low, Medium and High plans are available. Click Create to generate the application key. The application key secret is displayed in the Secret field. Click Copy Secret to Clipboard and then paste this application secret somewhere on your machine. Warning: This is the only time you will be able to copy your new key's secret. To get the application key, exit the Create New Application Key screen by clicking Ok. Your application key is displayed in the Value column. Record it for use with your the application secret from earlier. 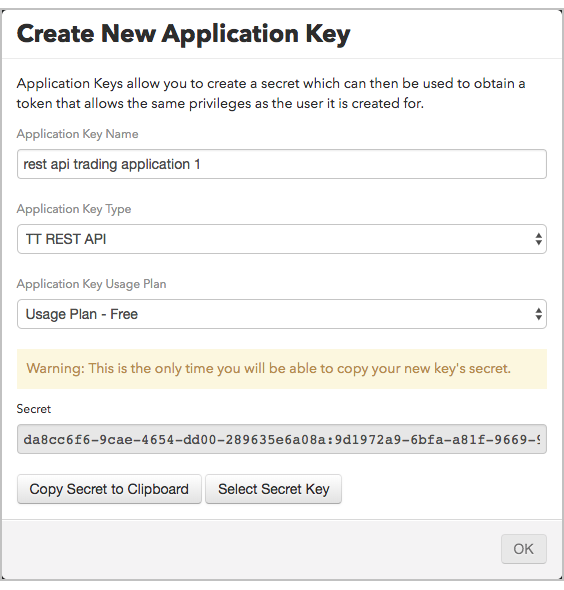 You can now use this application key to make requests to the TT REST API from your application as well as use the application secret to generate a token. Requests to the TT REST API use the following base URL: apigateway.trade.tt/<service>/<environment>. The value for <service> is documentated on each service's page. Free: Allows you to develop and test TT REST applications in UAT only with limits of 3 requests per second and 3,000 requests per day. Low: Allows you to run TT REST applications in the Live environment with limits of 5 requests per second and 15,000 requests per day. Medium: Allows you to run TT REST applications in the Live environment with limits of 10 requests per second and 30,000 requests per day. High: Allows you to run TT REST applications in the Live environment with limits of 25 requests per second and 75,000 requests per day. For more information about the costs associated with the usage plans, contact TT Customer Success. If you need help with TT REST API issues, you can submit a support ticket. To submit a support ticket, visit TT Support Center page in Resources section of the TT website and click Submit Incident. 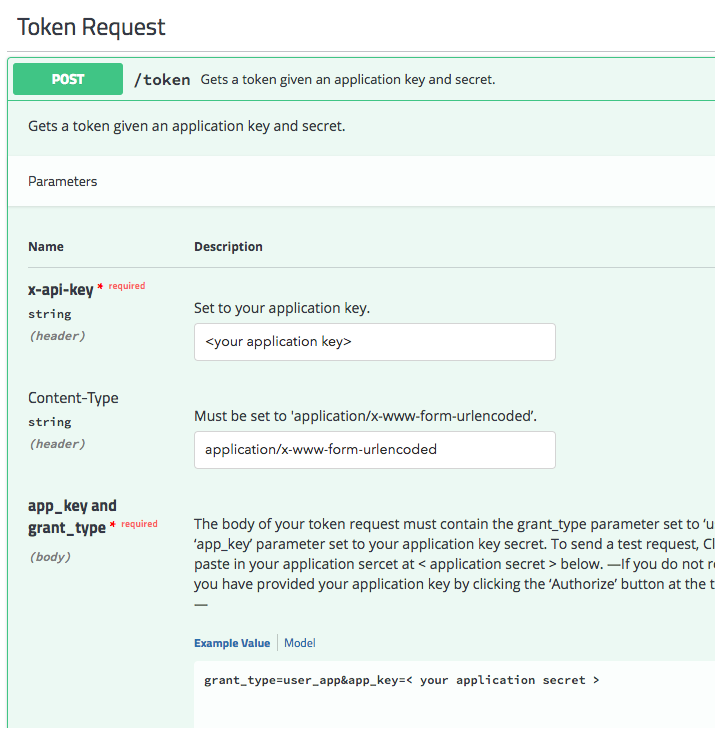 To get a token, you send your application key and application secret within a POST request to generate a token. Expand the '/token' documentation below to view the required parameters for generating a token. You can send a test request by clicking the "Try it out" button, entering your application key (Fig. 1) and application secret (Fig. 2) where prompted, and then clicking "Execute." Note: Tokens are set to expire after a given period of time. This period of time is communicated in the response including your token as the "seconds_until_expiry" value. Your application will need to generate a new token before its token expires.